Oh, it feels it's been eons since I made a bee block! I felt all kinds of rusty when I officially started working on my first bee block for the Wee Bee, a fun international bee filled with some great, super talented sewists. 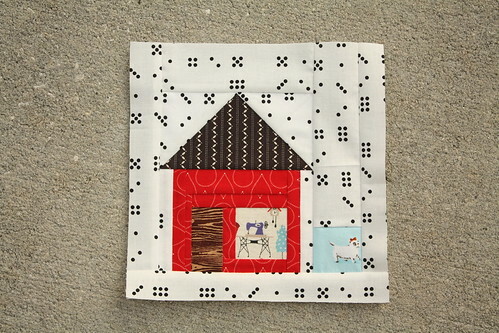 Our first queen bee is Cat of Cat + Vee, who requested a wee little house block. I went with a really simple house, paper pieced, of course, with a cute little fussy cut window into a sewing room, from a print I got back during a Japanese fabric swap quite some time ago. I can't believe that I not only remembered that I had a print like that in my sewing room but that I was also able to find it, because the sewing room is a bit of a disaster area at the moment.